Drywall Contractors are South Florida’s Premier Contractors providing a range of services that stretch from commercial construction to major remediation. Our company is on call 24/7 for any remediation service necessary. Drywall Contractors is one of South Florida’s only remediation contractors to hold the proper license to do the reconstruction of the homes after remediation. Mold can be uncovered in any structure of any age. Mold can seriously affect the indoor quality of buildings leading to many allergies and sickness in people. Drywall Contractors uses the industries latest technologies to remediate mold, both invasive and non-invasive treatments. Our company offers the proper indoor air quality testing and certification to assure your structure is Mold-Free. Water extraction is very important to promote a healthy environment. No matter if it is a major flood or a small leak, if left undetected it can lead to unlimited problems with a building. With the proper knowledge of buildings, Drywall Contractors will locate the water intrusion and eliminate the problem. Fire damage can be extensive. Smoke, Soot and burning are part of the fire remediation services that Drywall Contractors offers. Drywall Contractors can detect fire damage to structures that are both superficial and/or structural. Drywall Contractors is also licensed to make the structural repairs to damaged areas. Drywall Contractors has completed the remediation of over 75 single family homes, and over 150 apartments. Our Chinese drywall remediation division has been successful on getting families lives back on track. 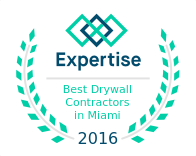 Drywall Contractors is one of South Florida’s only companies licensed to perform the remediation and the reconstruction of the building. Our company offers the highest quality reconstruction, to get your home back to its original state or better.